Body Beast Hybrids! 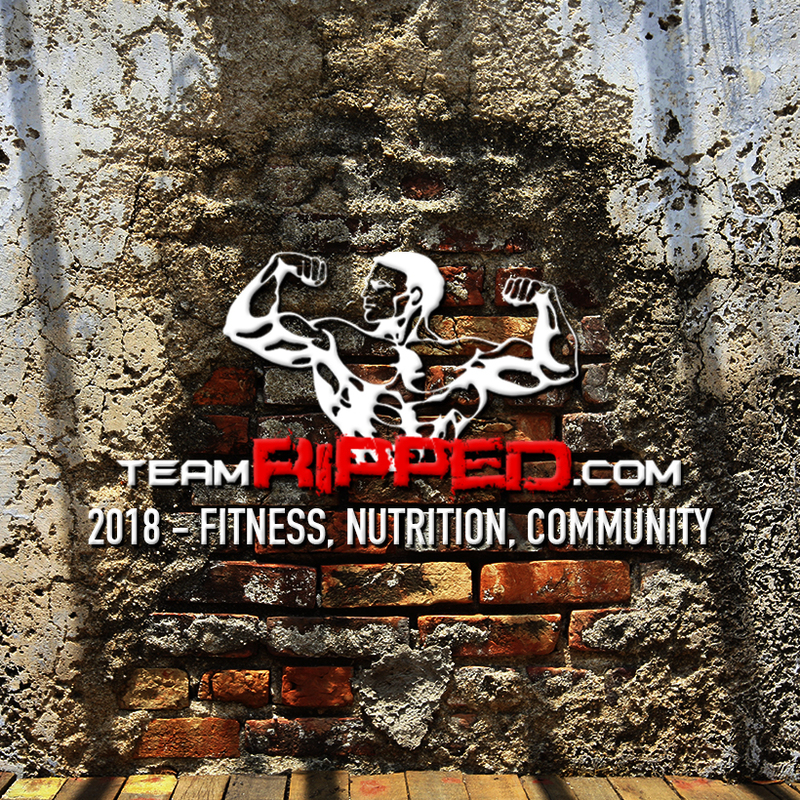 You’ve asked for more of them, so today I am starting with bumping these to the top of teamRIPPED! I have 2 new hybrids with Body Beast getting the finishing touches that will be posted tomorrow… so make sure you check back! 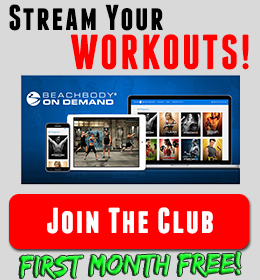 There is no doubt that Body Beast has been one of the most popular newer programs from Beachbody. I LOVE Body Beast! I have combined it with a lot of other workouts too (see my Beast/Cardio hybrid from last year). These are two new Body Beast Hybrids with two awesome accelerated workouts: P90X3 and T25. 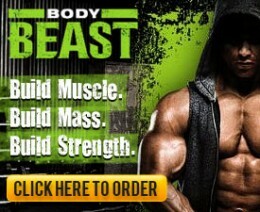 I have got a bunch of emails and requests for Body Beast Hybrids. The two most common were Body Beast/T25 and Body Beast/P90X3. I can’t leave you all hanging! I decided to take hard looks at all three programs and create some hybrids. 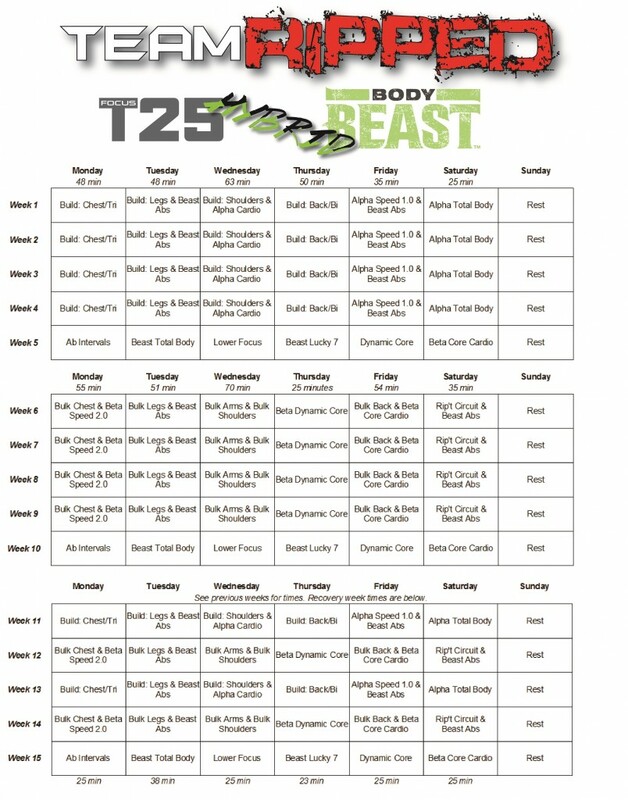 I really used T25 to add some extra cardio to this Body Beast Hybrid and give some really active recovery each week. Your focus should be on the Beast workouts. That is why I have them coming up first. Put all your energy and focus there. The T25 will not be as taxing as the Beast workouts, but you should be able to go hard in them without risking an injury. Trying to lift Beastly weights while completely exhausted is a recipe for an injury. DO THE BEAST WORKOUTS FIRST! I also kept abs to twice a week with Beast Abs. You will be using your core a lot in Body Beast and T25. There is really no need to hammer it that much more. I’m really excited about this one! If my knee was doing better, these both look like killer hybrids! 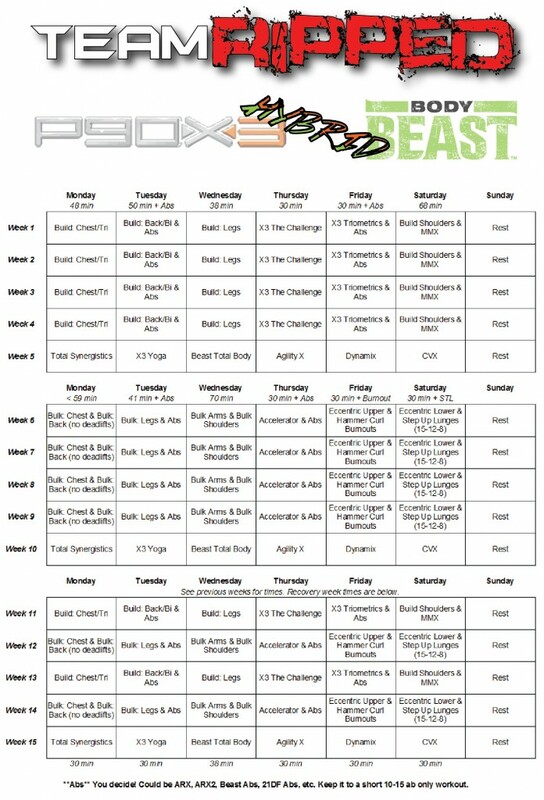 This Body Beast / P90X3 Hybrid is not for the faint of heart! It will push you. I set out to try to hit chest and back twice each week. Your legs will still get destroyed with Build and Bulk Legs from Body Beast AND they will get worked over with some Triometrics and Eccentric Lower. In Phase 1, your long day is Saturday. I tend to have more time Saturday (as I think most people do) so I made that a good burn. You work shoulders (small muscle group) and then burn it all with MMX. Every other day is a single workout. Take your time with BUILD and BULK Legs. Use that pause button and go heavy. Your cardio conditioning shouldn’t limit the weights you are picking. Give a little extra recovery time and get back at it! Again, you should be looking to add to your weights and reps throughout each normal week of the phases. The Recovery Weeks give your body time to recover. You will come back stronger! In Phase 2, you see your first modified workouts. I have Bulk Chest and Back on the same day. That being said, I am encouraging you to skip the deadlifts in Bulk Back and save them for Bulk Legs. That will same some time and keep the focus really on your back. 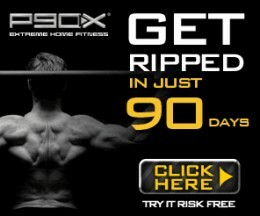 For Friday, you get Eccentric Upper from P90X3 but I want you to end with a hammer curl burnout. You will really destroy your biceps and get some extra forearm work in the process. Same for Saturday, do Eccentric Lower and end with a 3 set – 15,12,8 (like Body Beast Build Legs – but no drop set) of Step Up Reverse Lunges. I also included my favorite long day again of Bulk Arms and Bulk Shoulders. It’s a killer but so good! Grab a weight you can do 8-12 reps with. Do you 8-12, and drop by 5#. Do max reps with the new weight. Drop by 5#, do max reps. Drop 5#. You should drop at least 4 times or until you run out of weights – sometimes down to 5# dumbbells. For abs, I didn’t list a specific workout. That is up to you. I love rotating through my ab routines and this is normally how I do it. Just pick any ab workout and add it to those day. So are you going to take these on? Both would be great for leaning up for summer when you combine them with the right deficit and Fat Shredder. You could even add mass with both if you eat enough. These hybrids will definitely push you and give you solid weight lifting and extra cardio. Hope y’all enjoy them! BRING IT!! !